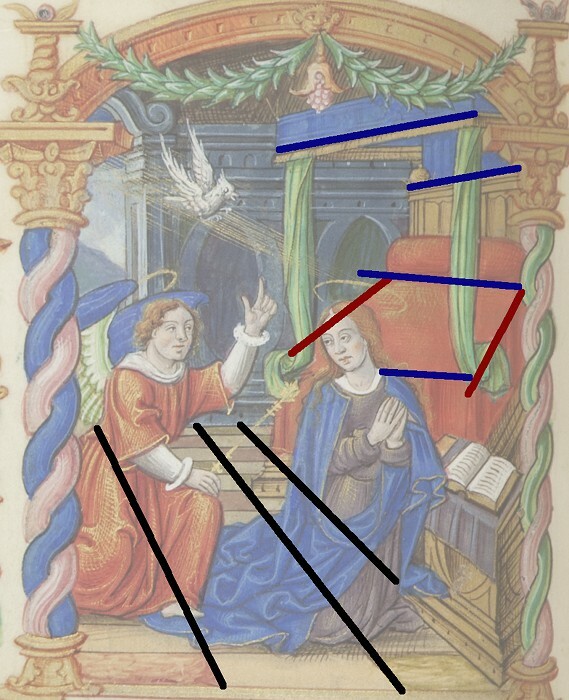 Not too long ago (22-June-2013) I wrote an annotatation on an illumination from a Book of Hours and included the comment that it was on exhibition and I might be able to see it if I got to Melbourne in the next few months. Last week I made an opportunity to go to Melbourne. Off the flight, bags left at hotel, straight to the library, up to the Mirror of the World exhibition, raced around it – and the book wasn’t there. This time I had to sit down while I took a few more breaths. 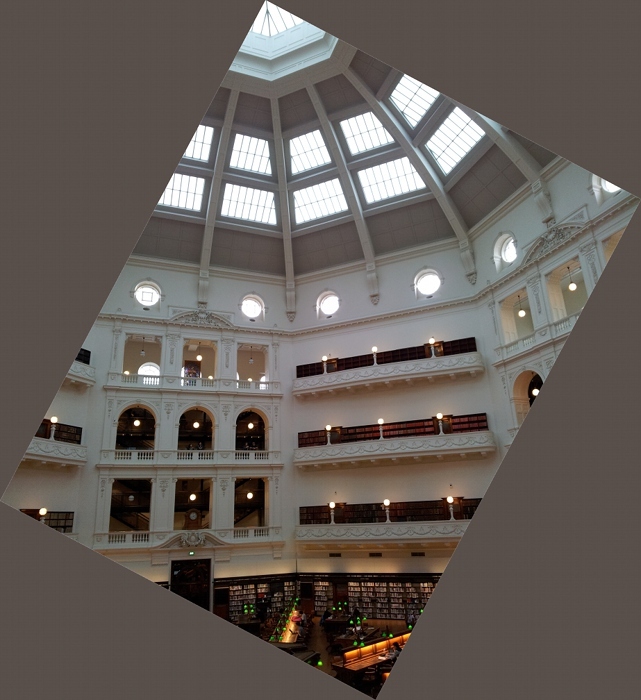 All wasn’t lost – I had big plans for things to see at the National Gallery of Victoria (NGV – more on that another post). But I should check – perhaps I’d made a mistake and The Book was in a different exhibition. I went down to the Information Desk and was probably fairly incoherent (it had been a 4:00 am start after all), and at one point I had the library website open on my phone while the librarian helping me was searching through their system and two of his colleagues were brought into the conversation. Eventually we concluded that The Book had been in the exhibition but had now been rotated out. They explained that The Book was all digitized and available on the web (http://handle.slv.vic.gov.au/10381/117039), and I agreed that it is a wonderful resource and I’d used it and appreciated it, and I was just hoping to see the book itself because you get the scale and the colour and the reality of it. The librarian’s next question took me quite a while and a few repetitions to understand and I still find it hard to believe. Would I like them to request it from storage? It was too late for the deliveries that day, but perhaps sometime tomorrow? I went into incoherent mode again, but eventually got out that I would like that very much. So the librarian filled in a little form and took my phone number. It was still a little unclear exactly where The Book was and whether any of this would actually happen. So I went off to spend some happy hours with Poussin and Rembrandt (more later!) and tried not to expect too much. The next morning I got a phone call from Des, a librarian in the Rare Books area. When would I like to come in? We settled on 3:00 pm, and after another happy few hours at NGV I arrived only half an hour early, and managed just enough patience to last until 2:55 before going in. The photo on the left was taken at 3:23 pm. The hand in that white glove is mine. I still feel a mixture of wonder and disbelief and excitement and breathlessness and just the smallest tinge of nausea. What an incredible privilege. Des had met me at the front security desk and we had a pleasant chat walking through to the Rare Books area off the Redmond Barry Reading Room (thinking back I think Des collected quite a bit of information about my background and interest in the manuscript – not vetting as such, but perhaps reassurance that I was OK despite chronic episodic verbal dysfunction (aka incoherence)). Our destination was a secure area, and just inside was a large table with book pillow and white gloves laid out ready, plus a small box. 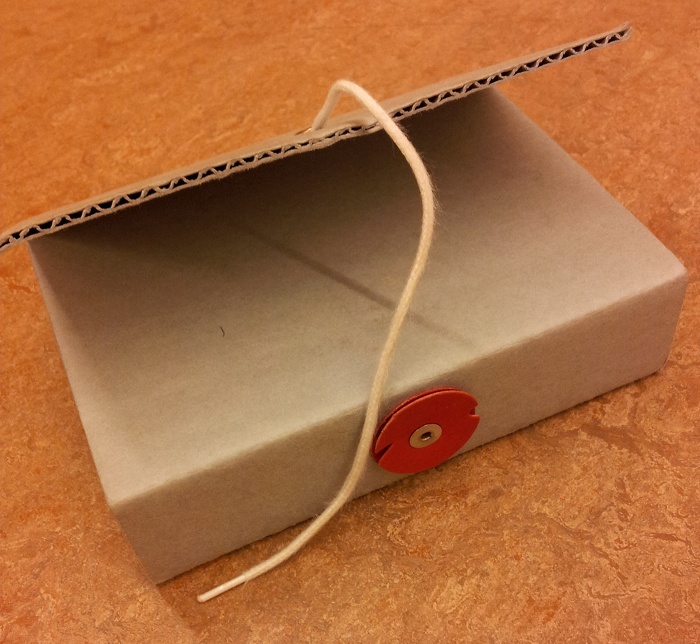 I’ve taken a couple of photos of the box because of a strong feeling that some day I’ll be making a work based on it. Aged Care, my final work for Textiles 1: A Creative Approach, used a container in a very claustrophobic trapped sort of way (see 20-May-2013 and 16-Feb-2013). I would love to make a different kind of container, one full of treasures and wonders. Here is The Book, sitting on its pillow. 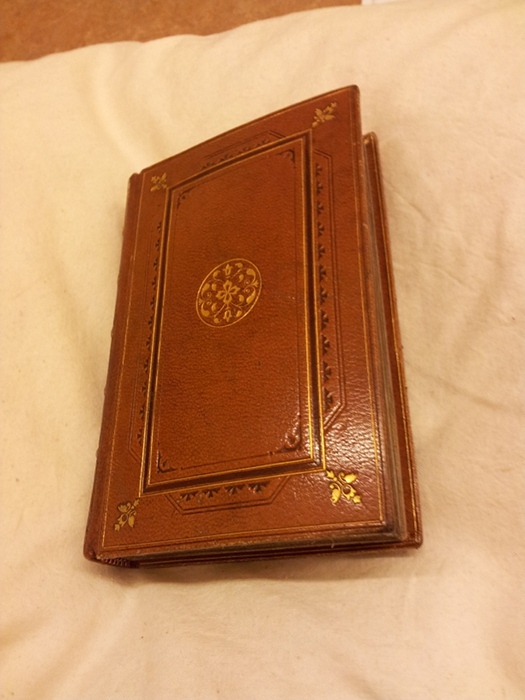 The binding is 19th century, not original, and the gilt edges of the pages would also have been added by a collector at some point. Des also photocopied some pages with more information about The Book (Manion, M. and Vines V. (1984) Medieval and renaissance Illuminated Manuscripts in Australian collections. (Melbourne: Thames and Hudson)) which has just led me on some delightful internet searching, through Rogier van der Weyden and back to another painting I saw in Melbourne at the NGV (see www.ngv.vic.gov.au/col/work/3945). Des left me alone with the book. 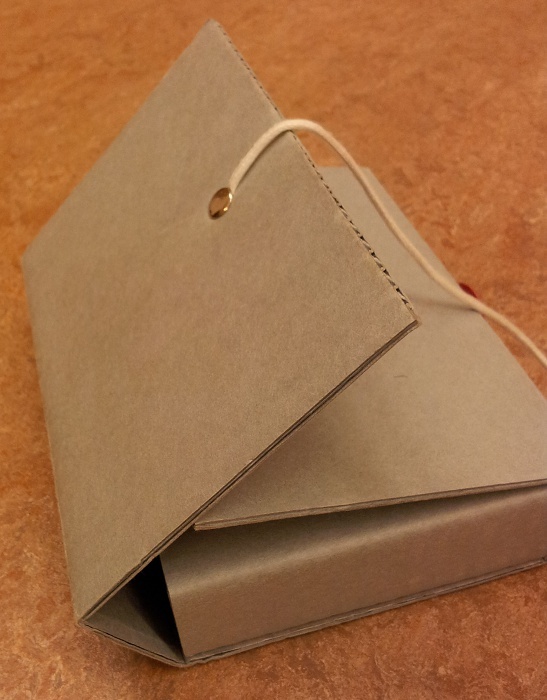 I could turn the pages and look as long as I liked at whatever I liked (being careful of the tight binding). I have no words to describe seeing and holding and leafing through that little book. Everything was more so – the book was smaller than I expected, the pages firmer, the lettering crisp and clear, the ink a beautiful translucent colour, the diacritical marks dancing on the page, such smooth variation in line width, and the actual illuminations – colour so vibrant and solid, lines so fine, the flush on the Virgin’s cheek, her pale skin and Joseph’s swarthy colouring… Well, perhaps I have lots of words, all inadequate. Before moving on, a quick look at the library’s domed reading room, which is celebrating its centenary this year. The library was founded in 1854 and was one of the first free public libraries anywhere. There was a lovely quote on a poster in the foyer (bad me – was busy being nervous and didn’t write it down) along the lines that any respectable person could use the library – they didn’t need a coat, just clean hands. Des told me they used to have a wash basin ready at the entrance. When reviewing my work on Project 1 (26-May-2013) I concluded with the unattractive prospect of increased discipline and focus. Happily discipline and focus turn out to be not such bad things after all and I am happy with what I’ve achieved in the last month. This took the form of some sketches based on photographs in books and on the internet. I was struck by some wording in the course textbook which suggested to me some ambivalence about the man. Pugin’s work in design and architecture was underpinned by his strong religious and moral convictions. I found links to the Pragmatic and Expressive aesthetic movements. 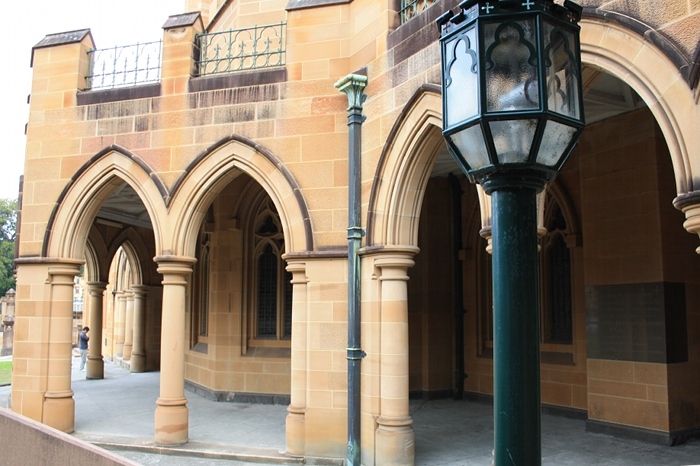 Always looking for a local connection, I was pleased to find an Australian link to Pugin. For this exercise I selected an illumination in a Book of Hours held in the State Library of Victoria (that local connection!). It was interesting to identify some of the symbols that would have held meaning for the original owner, and to speculate on who that may have been. I was fortunate to find another similar version that was produced for a much more exalted person. 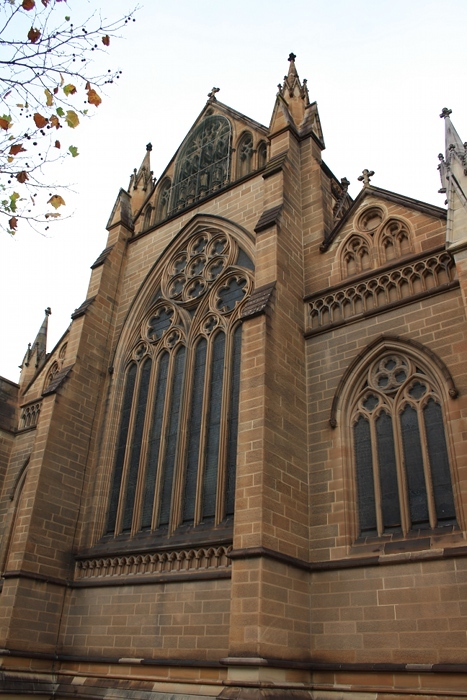 St Mary’s Cathedral in Sydney is a Victorian Gothic church designed by William Wilkinson Wardell. The daughter of bellringers, I have been familiar with this building all my life. It was fascinating to see it from such a different perspective and to learn more about its history. Part one: Classical and religious art. For this exercise I have chosen a manuscript illumination from a Book of Hours as my subject. Given I am limited to working from images from a book or the internet I prefer to avoid three dimensional works. Reasons for my particular choice include: I find it interesting and beautiful; it includes details suggesting pointed architecture; there are oddities of perspective; the book is held in an Australian collection and in a current exhibition, so I may be able to see it if I can get to Melbourne in the next few months; high quality images are available on the internet with no copyright restrictions. Title: Horae B.M.V. : illuminated ms. on vellum. In the chosen image a frame with features of classical buildings creates a stage. Front right Mary, kneeling at a prie dieu, turns at an interruption to her prayers. Front left an angel speaks to her. Rays of golden light stream in on Mary, a white bird hovers above. In the background is a bed to the right, an open window to the left, and some detailing (including pointed arches) which could be architectural or furniture such as a wardrobe behind. Below is a label with text in latin. The colours are rich – blues, scarlet, green, yellow, mauve, browns, white, with touches of gold throughout. There are shadows and moulding of shapes, using both tones of colour and hatching in grey and gold. 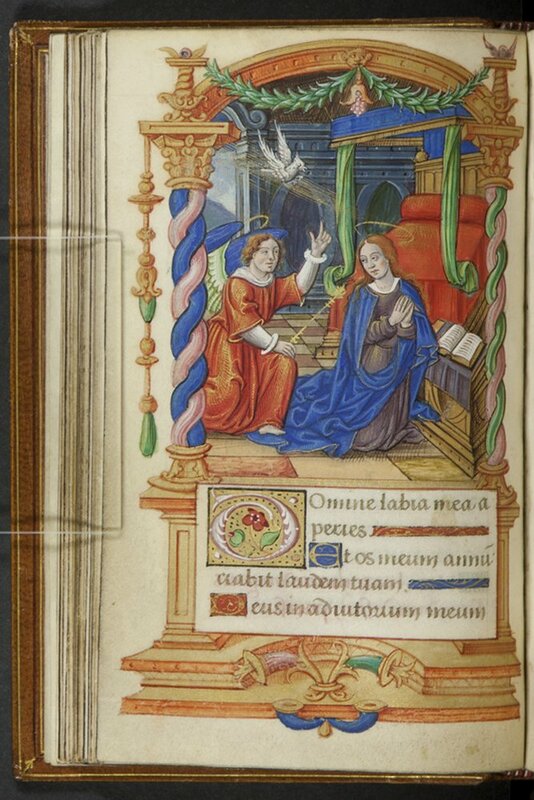 The illumination shows the Annunciation, described in the Gospel according to Saint Luke. God sent the angel Gabriel to the virgin Mary, who was betrothed to Joseph. Gabriel told Mary, who was at first deeply disturbed, that she had God’s favour. She would conceive and bear a son, Jesus. “The Holy Spirit will come upon you, and the power of the Most High will cover you with its shadow. And so the child will be holy and will be called Son of God” (Luke 1:35). The scene is rich with imagery. 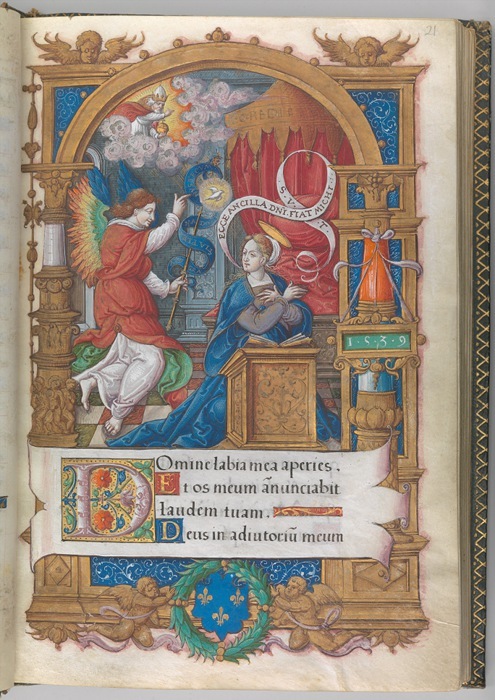 The Annunciation had great doctrinal importance in the Catholic church, and the three essential elements are displayed – the angel, the Virgin and the dove of the Holy Spirit. Garlands and flowers show it is Spring (northern hemisphere), nine months before the Nativity. Mary, devout, has been reading from an open book, according to St Bernard the prophecy of Isaiah which is being fulfilled in Mary at this moment. Her dress is blue, a colour symbolic of heaven. God the Father is not shown, but implied by the golden rays. Gabriel is winged, in part wears the traditional white, and hold a scepter (which may be tipped with fleur-de-lys, his symbol). Both Mary and Gabriel have halos, symbolising sanctity. The lilies below refer to Mary’s purity (1). The pristine bed suggests the virgin birth (2). The dove is quite unlike any I have seen before – I don’t know if there is any significance in this. Domine labia mea aperies. Thou O Lord wilt open my lips. Et os meum annunciabit laudem tuam. And my mouth shall declare thy praise. 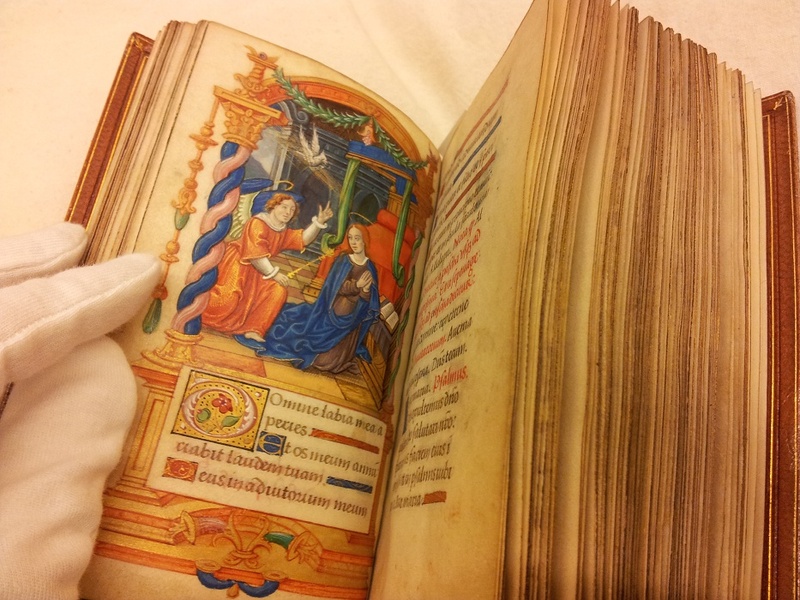 These books were so popular they have been called the “best sellers” of the Medieval age. They could be made for a specific patron, or on an effective production line for a large market. It has been suggested that this particular example was a typical workshop product, made for a lady given its “elegant appearance and dainty size” (5) (based on scale photographs it is just under 15 cm high). I mentioned oddities of perspective earlier, and here have tried to highlight different lines apparent in the image. The space is not really convincing, the bed about to slide into the foreground. Perspective is a Research Point in the next project, so I hope to come back to this at some point. This exercise has opened my eyes to some wonderful resources on the internet. Many institutions have programs to digitise and make available their precious collections. One that I particularly enjoyed was a comparison tool from Harvard University, which allows easy viewing of ten different Books of Hours – http://isites.harvard.edu/icb/icb.do?keyword=picturingprayer&pageid=icb.page264721 (Picturing Prayer: Books of Hours in Houghton Library, Harvard University). All of their examples are quite different to the two I have shown above. (1) Hall, J. (2008) Dictionary of Subjects and Symbols in Art (Second Edition). Boulder: Westview Press. 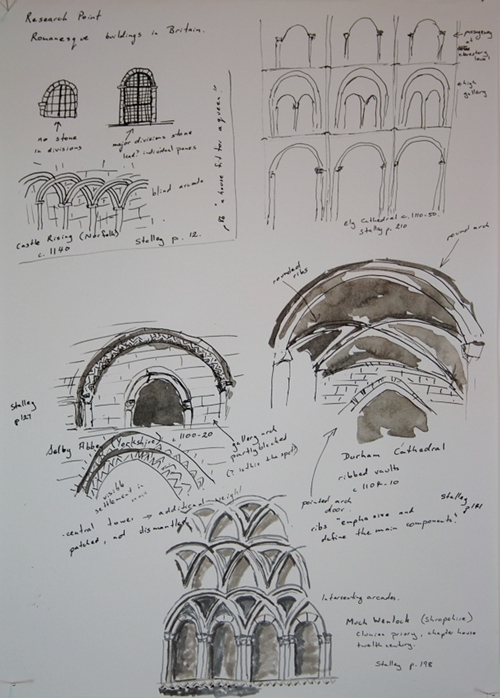 Notes on a question from the course notes: What, in Pugin’s view, was the overwhelming advantage of Gothic over other architectural styles? Augustus Pugin (1812-52) is known for his design of the Gothic interior and exterior ornament of the Houses of Parliament in London, amongst many other buildings in his short working life. He was a key figure in the Gothic revival in Victorian England. He also seems to have polarised opinion among his contemporaries and historians ever since. “…by a nimble shift of emphasis from styles to principles … Pugin freed the Gothic Revival building from the stigma of being a deception” (1). Trying to do some fast-yet-effective research, I was stopped in my tracks by that sentence in the course textbook. “A nimble shift of emphasis”. In my reading, that makes Pugin sound like a rather shady character, using some sleight of hand to distract us from his own nefarious agenda. A showman? A conman? I’m sure that’s very unfair. It must be unfair (to the textbook and to Pugin). But most things I’ve read have a similar sense of hesitation or reserve. Going further in the textbook I learnt Pugin believed that both humanity and architecture had fallen into poor ways. He espoused ‘the cause of truth over that of error’, the need for ‘sincerity’, that ‘there should be no features… which are not necessary for convenience, construction, or propriety;… all ornament should consist of enrichment of the essential construction of the building’ and ‘have a meaning or serve a purpose’. Rather than building shallow copies, shams of historical architecture, methods should be revived, materials respected and emphasis placed on underlying principles of construction. Further, ‘it is in pointed architecture alone that these great principles have been carried out’. (All quotes are from Pugin, as given in Honour and Fleming pages 663-664). A link to Pugin’s conversion to Catholicism is mentioned, the general purpose of integrity and truth seems very current today – but this doesn’t tell me why pointed (aka Gothic) architecture was the answer. A paper by Michael Bright (2) gave the background and contemporary context needed. One aesthetic theory dominant in the eighteenth and nineteenth century was the Pragmatic – artwork with the practical functions of pleasing through beauty and instructing through symbolism, thereby eliciting a response in the viewer. Architecture has the further underlying function of providing shelter. A example of this is the pinnacle on a flying buttress. A practical function is the addition of weight and strength to the structure. A symbolic function is a reference to the Resurrection through vertical lines. A second aesthetic movement of the time was the Expressive, revealing the artist’s feelings and thoughts. Pugin believed that a true revival and restoration of Gothic architecture must be through the ‘restoration of the ancient feeling and sentiments’ (quoted in Bright, page 156). A building is a collaborative effort of architect, commissioner, craftsmen and more, and thus can express the beliefs, religion, customs and environment of an entire society. This introduces the idea of a building or other work of art expressing the values, worth and morality of the artist. Pugin believed that the architecture of the middle ages was superior because of ‘faith, the zeal, and above all, the unity’ of those who designed and built (quoted in Bright, page 158). Pugin deplored the Renaissance, the Reformation and the classical (to Pugin ‘pagan’) revival. Also, if an architecture was to be a true expression and reflection of a man and society it should be consistent and truthful, not a mishmash of conflicting styles and symbols. For Pugin pure Gothic was an expression of faith, of Christianity, of morality. This explains the “overwhelming advantage” of Gothic. It also explains some of the ambivalence to the man, who in his idealism and zeal could be intolerant, inflexible, petulant and abrasive. “The canons of Gothic architecture are to him points of faith, and everyone is a heretic who would venture to question them” (John Henry Newman, quoted in Bright page 160). * There is debate about the extent to which Pugin’s writings influenced John Ruskin. Both were concerned that a building should be designed to meet its purpose; that symmetry purely for appearance was absurd; that there is a strong link between the value of a work and the morality of the designer and builders. However Ruskin attacked Pugin in his writing, was vehemently Protestant and anti-Catholic, and had different attitudes to workers among other differences. * Bright suggests that Pugin was more open than Ruskin to the use of machines, appreciating the time they could save. “We should not, he [Pugin] tells us, cling to the old because of its antiquity or reject the new because of its novelty, but should judge all according to sound principles.” (4). Kenneth Clark believed that the major creative impulse of the period was in engineering – using new materials, transforming building. I like that Pugin, in all his zeal, was not entirely closed to the new. To me any building that looks back to an “authentic” past risks being inauthentic itself. To ignore perversely the changed context of the building compromises it. Through evolution or revolution, intelligent, informed, thoughtful, selective use of new materials and techniques is my preference. This is particularly important to a weaver. Many weavers find great pleasure in the beautiful reproduction of traditional patterns, but for me they should be reinterpreted, made personal, be renewed by the weaver – or architect/designer/craftsperson – or risk stagnation. Every “rule” is subject to question, to ongoing testing, to change. * the mention in a quote above about the “canons of Gothic architecture” takes me back to my earlier struggles with the concept of the canon of Western Art (see 28-April-2013). It’s good to read about an example of the canon in flux. (1) Honour, H. and Fleming, J. (2009) A World History of Art (revised 7th edition). London: Laurence King, page 663. 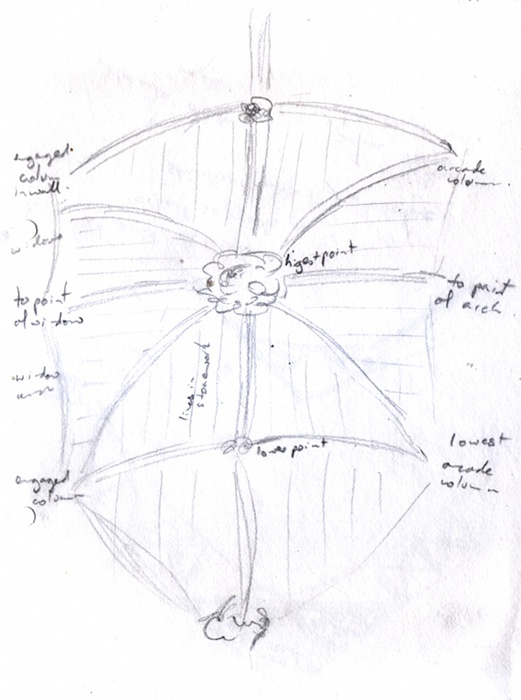 (2) Bright, M. (1979) A reconsideration of A. W. N. Pugin’s architectural theories. Victorian Studies. 22 (2), pp. 151 – 172. (3) Clark, K. (1969) Civilisation London: British Broadcasting Corporation, page 330. (4) Bright, op. cit. p. 170. Yates, N. (1987) Pugin & the medieval dream. History Today. 37 (9), pp. 33-40. Research Points are an opportunity to delve more deeply into particular aspects of a topic. Given time constraints this post is the merest scratch on the surface rather than a full-scale dig. 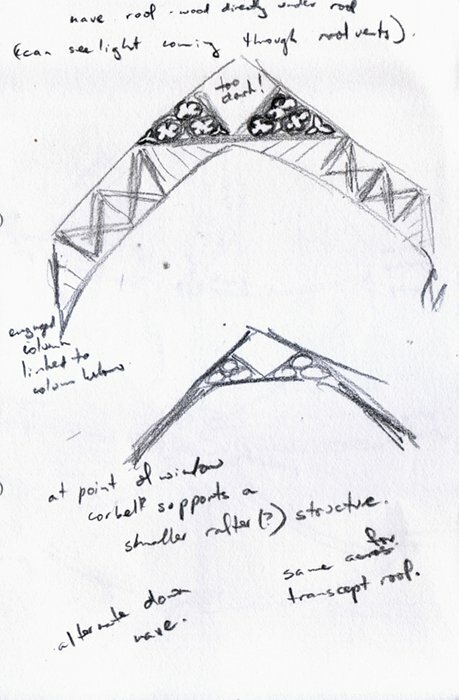 Semi-circular arches were widely used in Roman architecture in entryways, arcades and tunnel vaults. 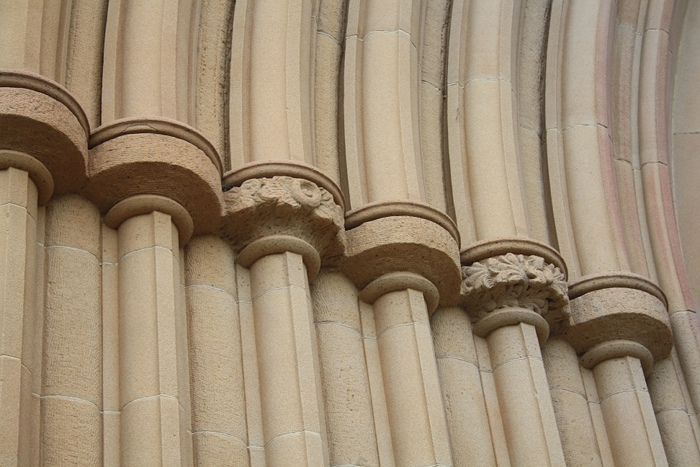 All of these uses are seen in Romanesque architecture. 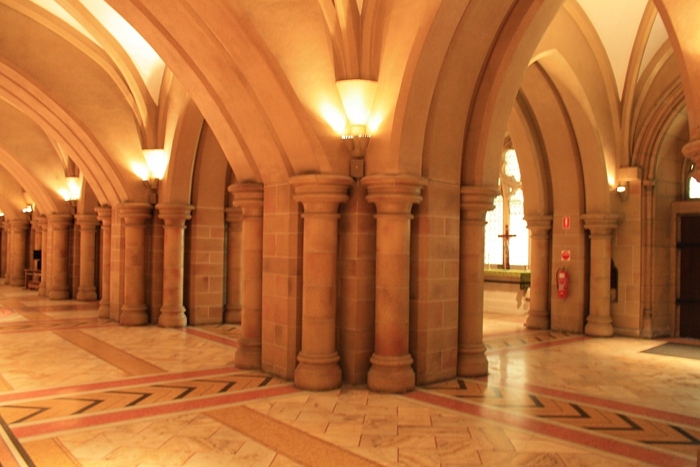 Architects and builders in the Romanesque period pushed stone vaulting further, to develop groin and ribbed vaulting. * the nave of Ely Cathedral, circa 1110-50, showing arcade, high gallery and passageway at clerestory level. * Selby Abbey (Yorkshire) circa 1100-20. The great weight of the crossing tower caused visible settlement in the nave. Masons patched and partly blocked open areas, rather than more major dismantling/rebuilding work. * Intersecting blind arcades at Much Wenlock (Shropshire), the chapter house of a Cluniac priory, twelfth century. Wanting to show the various vaulting developments, I found The Corpus of Romanesque Sculpture in Britain and Ireland (http://www.crsbi.ac.uk/index.html). This is a wonderful and scholarly resource. The glossary (http://www.crsbi.ac.uk/resources/glossary.html) is particularly helpful with photographs and brief descriptions, while elsewhere on the site detailed descriptions of buildings and their features demonstrate how to put that new vocabulary to good use. The search function is limited – my tip is to search using Google, including britain romanesque crsbi in the search terms. 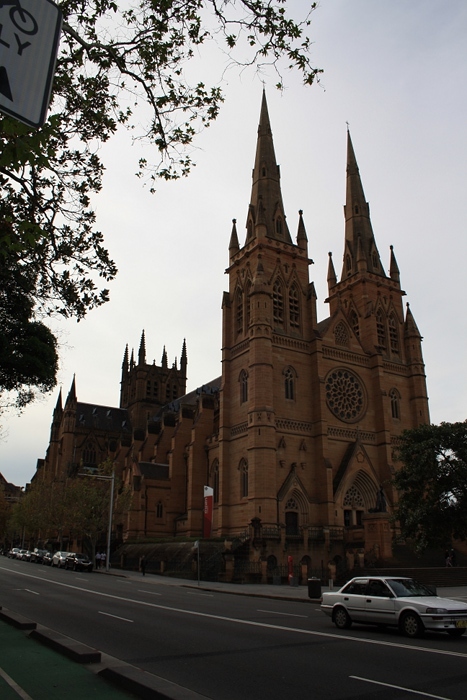 In one sense St Mary’s Cathedral in Sydney was completed in 2000, when building of the front towers’ spires was finished. However the design of the spires, and of the cathedral as a whole, is Victorian Gothic as planned in the 1860s by architect William Wilkinson Wardell. 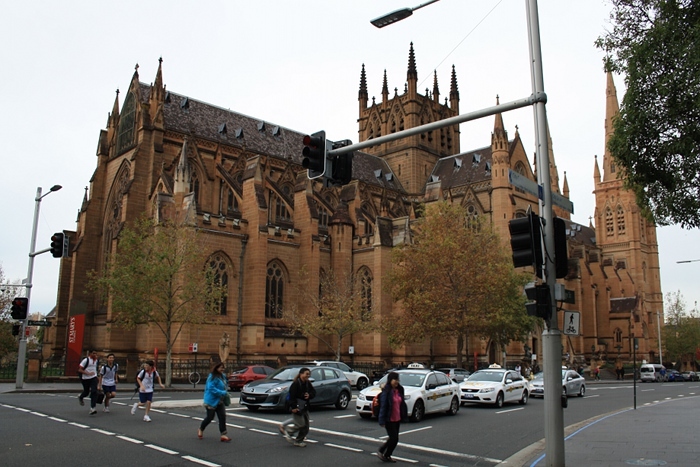 The cathedral’s site was granted to the church in 1820 by Governor Lachlan Macquarie and it is close to Hyde Park Barracks (see my previous report, 11-May-2013). Building of the original church progressed slowly, the first mass being celebrated in 1833. Additional works included an 1843 bell-tower and an 1844 chapter house, both designed by Augustus Pugin. Pugin also designed extensions to the cathedral, with work commencing in 1851. However in 1865 fire destroyed most of the complex, with only the chapter house and a single pillar of the original cathedral still standing today. Archbishop Polding commissioned Wardell to design a new cathedral, writing “I leave all to you and your own inspiration in the matter. I will not even say that your conception shall be restricted to the Gothic style of any particular period.” (1) This is slightly ambiguous, but I take it that any design was acceptable – with the assumption it would be a variant of Gothic. 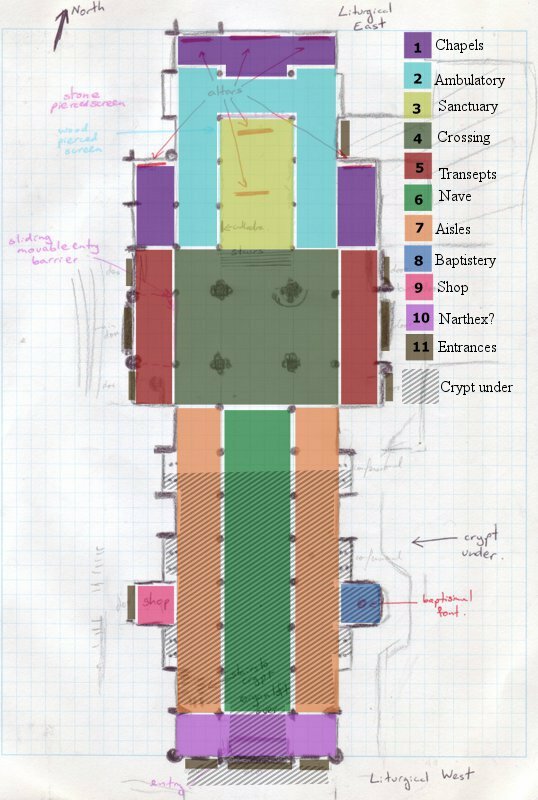 On the left is a rough floor plan of the cathedral, based on observation and counted steps on my visit. There is a strong emphasis on the longitudinal axis – the cathedral is 107 metres long, the nave including aisles 24.3 metres wide. 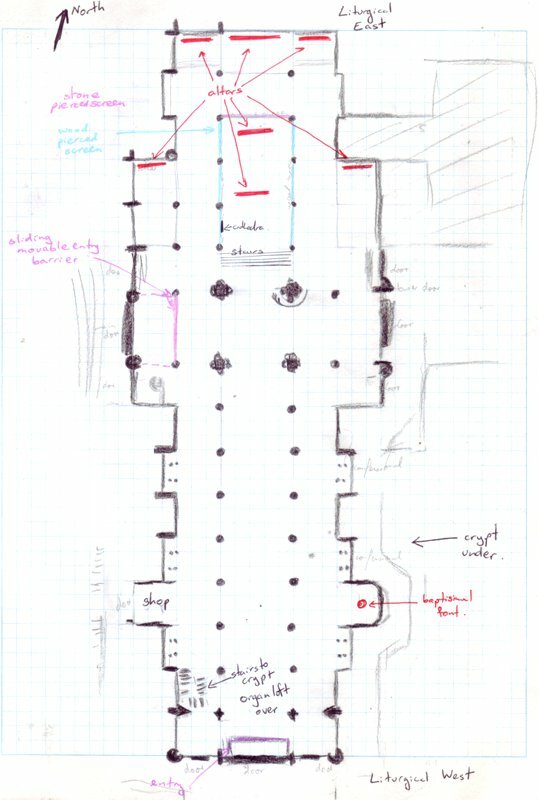 Site considerations combined with the intended size of the building led to orienting the cathedral with the main altar (the liturgical east) to the north. The cathedral is basically a cruciform shape. 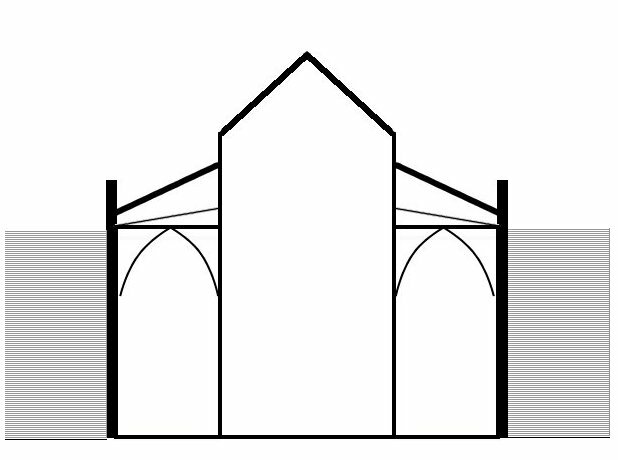 A cross-section shows the high nave supported by flying buttresses, the lower aisles, and an indication of the width provided by the transcepts, baptistry and what I believe could be described as axial chapels. The plan on the left highlights the various areas of the cathedral. The chapels are up a step, have low railings and in some cases different floor treatment, but are not actually screened from the main body of the cathedral. The sanctuary is raised a few steps and is screened at the sides with a reredos at the back. I am not sure what to call the section at the south (liturgical west) which includes the two side towers. From my reading “narthex” seems the most appropriate, although a more elaborate version on a Romanesque church would be “westwork”. Inside the cathedral it is largely hidden by a large organ loft. 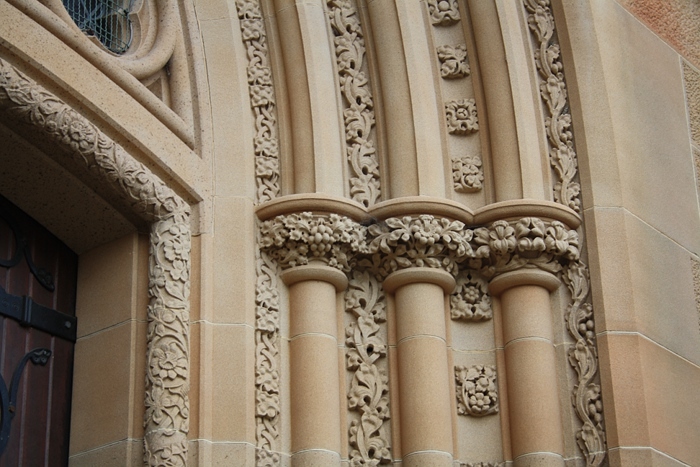 The cathedral was built of dressed Sydney sandstone with extensive carved detailing. Construction of the cathedral was in stages, as finances allowed. The foundation stone was set in 1868 and the northern end was opened and dedicated in 1882. The central tower was completed in 1900, while the nave was opened in 1928. The spires of the front towers were built 1998 – 2000. Effects of this sequence can be detected both internally and externally. 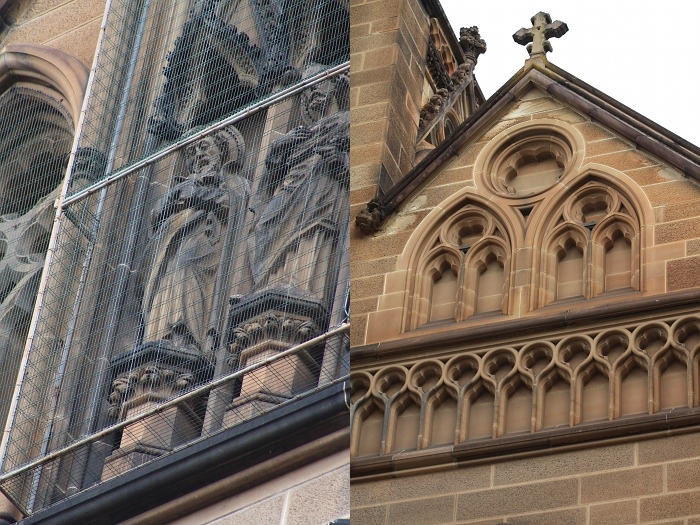 The image at the right is a compilation of some of the many carved heads around the windows – and one of the many uncarved blocks. All the blank blocks I saw were towards the rear of the cathedral. 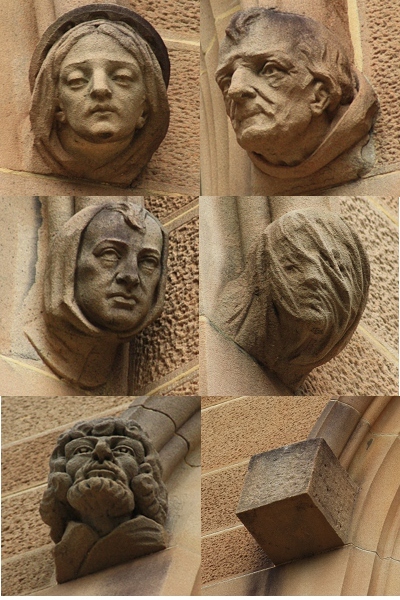 The head on the bottom left is from high on the south-east tower and and is quite different in style to the other heads (all from the north-west wall). The differences are more dramatic on the three doors at the southern end. The surrounds of the left door are richly carved with great variation in the detail. The surrounds of the door on the right are molded but not carved. Most fascinating are the central doors – I presume in terms of ceremony the most important doors of the building. The surrounds are largely uncarved, although the beginnings of work can be seen on two of the column capitals. The northern (liturgical east) wall shows many of the features that would be seen in an original Gothic church. There are pointed arches, elaborately carved finials, blind arcades, statues and stained glass. Elsewhere in the building are elements that would be less familiar to a medieval stonemason, such as carvings of some of our local fauna and even more the steel framework of the new spires. Photography is not permitted inside the cathedral, so I have only my rough sketches to give a sense of the interior. A series of compound piers run the length of the nave and sanctuary. Each includes eight engaged shafts. A total of six of the shafts support the arcade, the seventh continues up to the ceiling of the nave and the last supports the ceiling of the aisle. While the capitals are doric and the engaged shafts quite plain, fluting on the arches and additional moulding creates a clean but rich effect. A triforium-gallery adds to the play of light and shadow. Amber glass in the clerestory windows provides only subdued lighting – very effectively supplemented by modern directional electric lighting and many candles. An impact of the staged building effort can be seen in the ceiling treatments in the cathedral. The ceiling of the chancel is vaulted in timber, with eight compartments in each bay. The aisles are rib-vaulted in stone. A nice detail is the lines carved in the stone which echo those of the timber vaulting. However the nave roof uses hammer-beams. 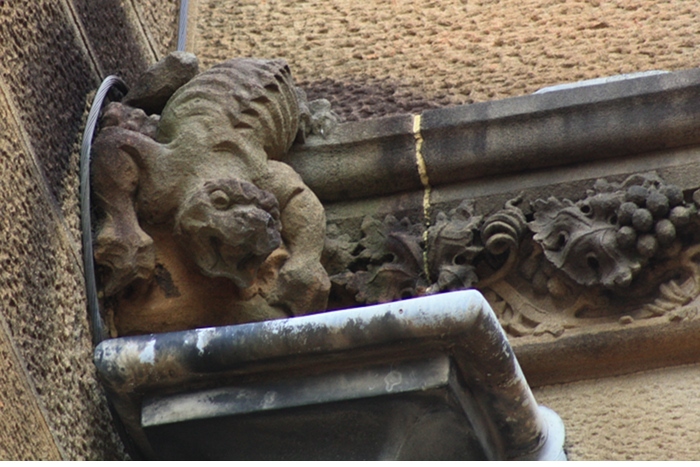 These vary depending on the support point (engaged shaft or above clerestory window) and are carved providing visual links to some of the window tracery. While attractive I suspect that this construction method was chosen with an eye to speed and cost in the building effort. There are elaborately carved altars in the chapels, including many designed by Wardell. There is a tomb commemorating those lost in wars, but no other free-standing statuary or memorials outside of the chapels and sanctuary. This provides a very open, uncluttered and contemplative space. I was able to take one “internal” photograph while observing cathedral requests. This was taken from outside the transept on the eastern side, looking across to the rose window on the western side and the organ below. 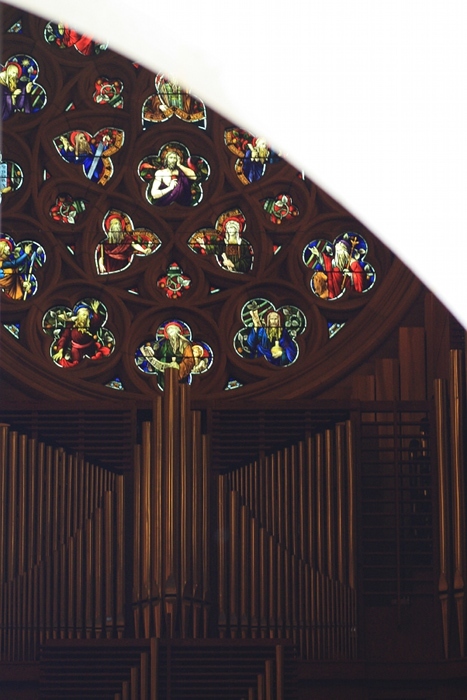 Stained glass in the cathedral includes images based on the early history of Catholicism in Australia and other local themes in addition to stories of saints and from the bible. There is a crypt below the nave and here the fall of the land has become a positive. On the western (city) side of the cathedral there are just a few stairs up to the entry. On the east side, seen here, there is space for easy external access to the crypt. There are also stone internal stairs at the back of the church. Photography is permitted in this area, so I am able to show the huge structure underpinning the cathedral. Rather than the compound pier upstairs, here there is a system of central pier and detached columns. The relatively low ceiling is rib vaulted. I couldn’t determine the building material – it certainly did not look like raw or dressed sandstone. 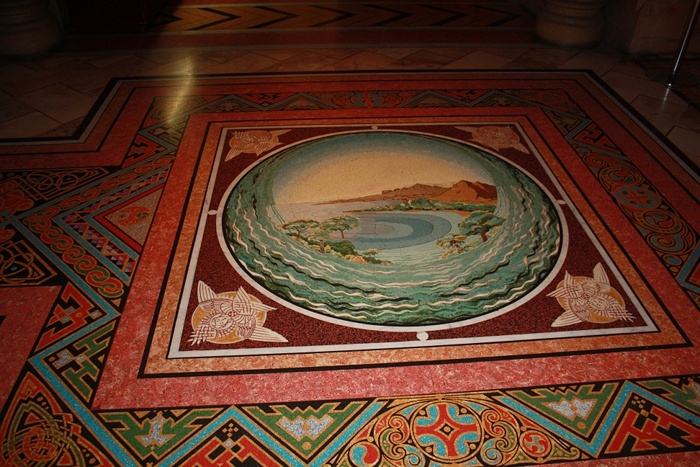 A significant feature of the crypt is the terrazzo mosaic floor. Completed in 1961 by Melocco Brothers, the design forms a Celtic cross with a series of medallions of the Days of Creation. 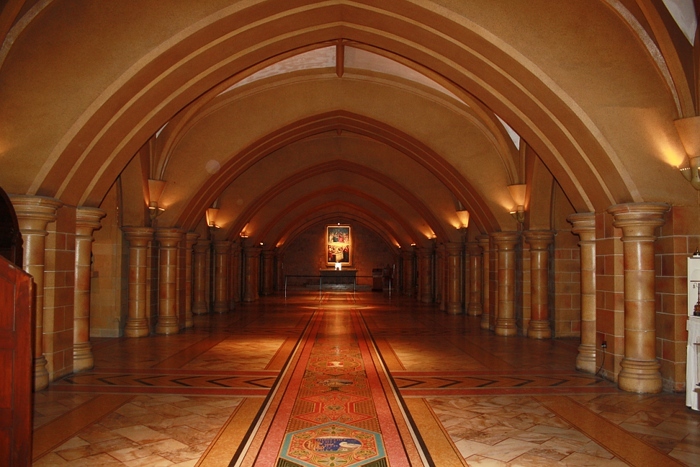 The crypt is a sanctuary, holding the remains of Archbishops and pioneering priests. It is also used for weddings and other services. 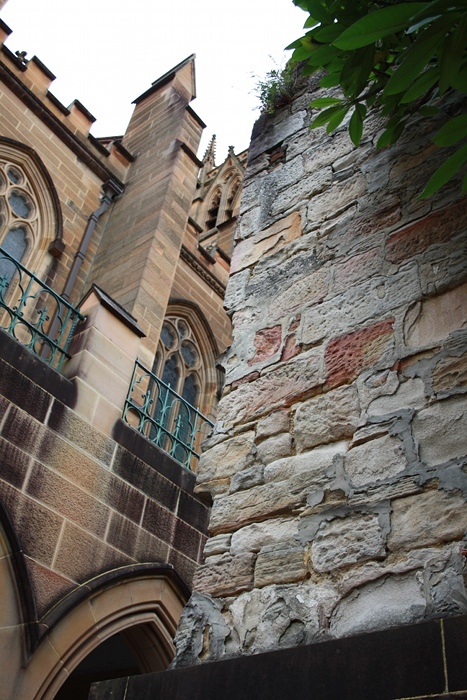 The history of the building of St Mary’s cathedral is closely linked to the history of Catholics in Australia. 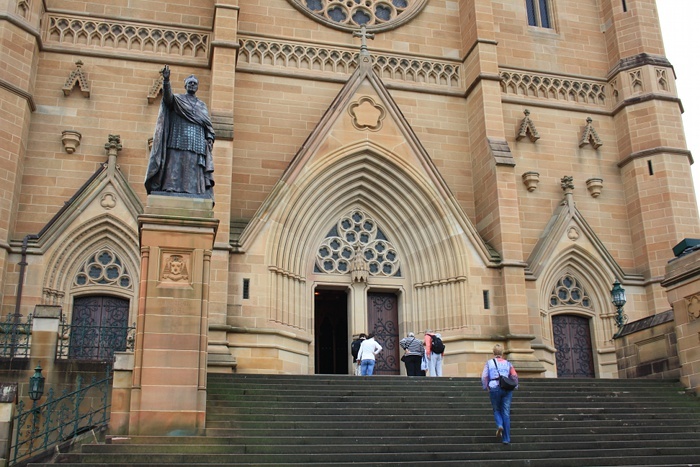 When I visited it clearly played an active part in the spiritual life of many Sydney-siders, with a well-attended lunchtime service (which I thought was well paced to meet limited time availability). The various chapels provide spaces in a variety of sizes for different usage. It is also a popular tourist attraction, and the cathedral authorities have responded with physical changes (particularly an entry vestibule at the western door), signage and discreet staff, allowing visitors to enjoy the building while minimising any impact on worshippers. Technology has been introduced (lighting and sound the most obvious) to enhance the experience. There is an active conservation effort. Work also continues to “complete” still more of Wardell’s original design, a recent example being the commissioning and installation of statues in the reredos (2). Preparing this report has been a fascinating shift of perspective for me. Coming from a bellringing family, from my earliest years I have spent many hours in the Cathedral (dad was Captain and Ringing Master for many years), but much of it I had never noticed before. This photo is from ground level below the transept on the eastern side. 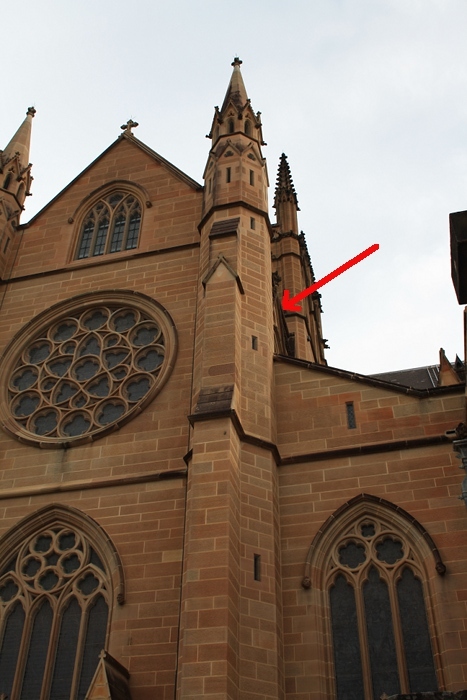 There are 111 stone spiral steps up that turret, and the red arrow shows where the next photo was taken. 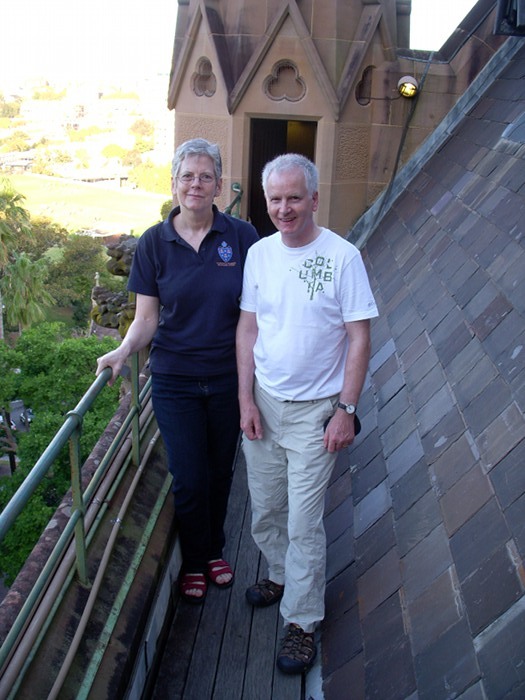 This is me (with a goofy expression unfortunately) and a ringing friend with that same turret behind us. We’re on a wooden walkway across the base of the roof, about to go up some more steps to the ringing chamber in the central tower. So you can now see that the roof is slate! Curl, J.S. (2006) Oxford dictionary of architecture and landscape architecture (2nd edition). Oxford: Oxford University Press.